Good skating starts with properly cared for skates, and contoured skates help you skate better and easier. Contouring can repair most damage to blades caused by poor skate sharpening. While the system is designed for hockey skates, goal skates and speed skates can also be corrected. Custom Radius is a contouring system of shaping sharpening and balancing skates to provide increased performance for all skaters, both professional and recreational. Skates made today are the product of years of development, and now represent state of the art technology. Even so, manufacturers cannot economically provide a matched pair of blades "ice ready" to the individual specifications of each skater. Blade edging is usually done free-hand, and may cause problems for skaters, with their performance being lower than their expectations. Contouring is blade shaping, not sharpening. Skate contouring is a precision system of shaping skates to the individual specifications of each skater. Accurate positioning of the balance point on the blade provides maximum stability and manoeuvrability. The concept of contouring is to center a skate for the proper Lie and Radius. Once or twice a year skates should be contoured to give them the proper Lie and Radius. After they have been contoured, they are sharpened as before. 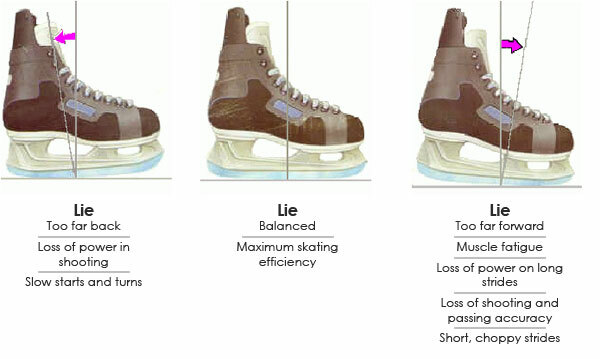 Skates direct from the factory are inconsistent, and in a majority of cases have the incorrect lie for the individual skater. Our competent skate care specialists can handle all your skate care needs from sharpening to matching your blades. For years sharpeners have been "rockering" skate blades. The idea was to put a radius on the blade to increase manoeuvrability. Although the idea is sound, the operation is "free-hand", consequently there is no consistency of radius, and more importantly, no consistency in the lie of the radius. The radius on a "rockered" blade extends from toe to heel, and too much blade is taken off both front and back. The quality of the "rocker" was dependent on the skate sharpener. The results were inconsistent and often proved harmful. Contouring on the other hand is not a "free-hand" operation. Contouring shapes and balances blades to match the skaters' natural stance and style. A contoured pair of skates has the same lie, and each skate has an equal amount of blade. In addition the contouring system has the unique advantage of being able to contour your new skates exactly like your old pair, so you don't have to re-adjust your skating style. Contouring takes out all the guesswork and gives you the same quality workmanship time after time. The Radius of a skate is actually a portion of a circle ground onto the blade. The length of the radius controls the amount of blade touching the ice. The correct radius is a balance between manoeuvrability and stability resulting in maximum control and reduced muscle fatigue. A contoured pair of skates actually has three radii on it. The large, working radius extends across much of the center of the blade. The back and front radii are blended into this working radius and are equally as important. The front radius is used at the end of each leg thrust, and the back radius supports the skater while cornering. The Contouring System uses the concept of radius to give you maximum manoeuvrability, stability, and balance. The Lie of a skate is the pitch of the center Radius. It is this pitch or Lie, that controls the skater's posture. Radius is actually secondary to Lie in proper skating. Even though the Radius may be correct, if it is not pitched properly, the skater will experience great difficulty in skating. With the correct Lie, the high point of the working radius is slightly toward the heel, and there is less blade along the front. Consequently the skater's knees bend slightly, "unlocking the body. When standing erect, a skater should be evenly balanced and comfortable. If the lie is too far back, the knees and ankles will be forced to bend. If the lie is too far forward, the legs are locked into a rigid position. The Contouring System uses the concept of Lie to give the skater proper posture by pitching the working Radius slightly forward, unlocking the ankles, knees, and hips.